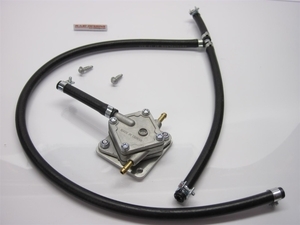 This is a no-brainer for your SuperEnduro, the stock Mitsubishi fuel pump is way too unreliable and way too powerful for the consumption of the 950 engine. This means that besides from the fact that you can be stranded in the middle of nowhere, riding hard enduro paths and bumpy surfaces will flood your engine. It also complicates the removal of the tank. 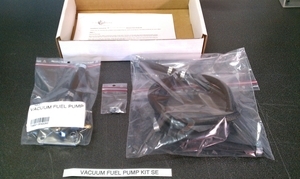 By buying our Vacuum Fuel Pump Kit you are killing 3 birds with one stone. The vacuum fuel pump is very reliable and it is very easily installed by following our installation guide, only the tank need to be removed. It is also very easily serviced should it in the future ever fail. A rebuild kit is approx $10/6EUR and you can reach it without removing anything as it is located on the rear left side of the air box. The capacity is much more suited to the 950 at 31l/h which means that you can push it hard in the woods/over the whoops without flooding or fast in the desert without starving. The kit includes everything needed for installation.